Laziness descends to another level! I remember being appalled on a recent shopping trip to Waitrose to find pots of ready peeled garlic on sale in the vegetable aisle . 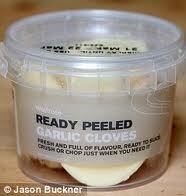 Now I’m all for saving time and making my life easy but really, just how difficult is it to peel a clove of garlic? The madness continues however. 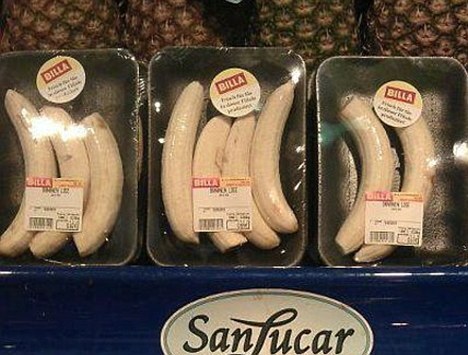 I’ve read this week about a supermarket chain which has been forced to apologise after they stacked their shelves at stores in Austria with peeled bananas – pre-packaged and wrapped in foil. German-owned Billa, which calls on its own customers to use more common sense when it comes to the environment, was slammed by customers who took to Facebook and Twitter to condemn the move. Shoppers first became aware of the wasteful product after the store itself allegedly posted pictures of the product online. You have to ask yourself what is going to be next? Are we really that consumed with our lives that eating, one of the most basic and simple pleasures in life, has become such a chore that we can’t do anything for ourselves any more. Exactly how far away from just taking a pill to satisfy our hunger cravings are we? I for one will definitely NOT be going down that route! Quite apart from enjoying the whole process of preparing and cooking food, there is nothing more satisfying than others enjoying your handiwork. So you can keep your ready-made meals and pre-prepared products – I’m not buying!!! Posted on September 22, 2012, in Food, General and tagged Austria, bananas, Billa, Facebook, garlic, German owned, Germany, ready peeled, Twitter, Waitrose. Bookmark the permalink. Leave a comment.